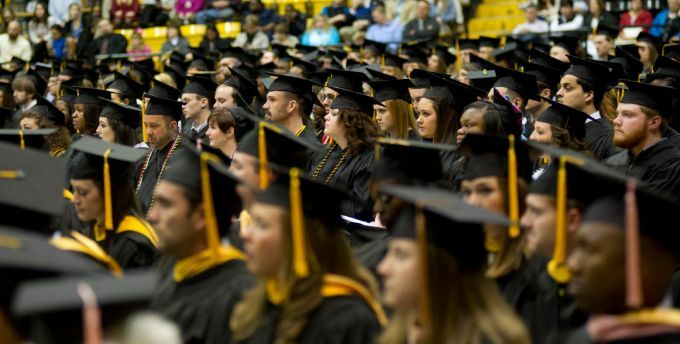 The University celebrates the commencement ceremonies twice a year in Hattiesburg (December for summer and fall candidates; May for spring candidates) and an additional ceremony in May for USM Gulf Coast students. Doors will open 90 minutes prior to each ceremony. Families and guests are urged to arrive in time to be seated at least 30 minutes in advance for the start of the processional. Please allow adequate time for parking, walking and seating in Reed Green Coliseum. For parking and traffic flow, please refer to the map link on the left. In keeping with the spirit of academic traditions, both faculty and students will process into their seating on the floor of the coliseum and later recess at the conclusion. The university will call individual candidates’ names as they cross the stage. Doctoral students will also be hooded individually on stage as their names are called. Family and friends will be able to take photos from their seats. A commencement photographer from LifeTouch Photography will be available to take photos of the candidates during the ceremony. Students may choose to have their photos made in advance of the ceremony through Southern Miss Photo Services. Call 601.266.4149 to set up an appointment in Hattiesburg. All Undergraduate and Graduate candidates who have filed for degree must reserve a seat for Commencement. RSVP online. Guests and students with disabilities who need assistance may contact the Office of Disability Accommodations (Hattiesburg) at 601.266.5024. May 9 & May 10 - Hattiesburg Ceremonies ... Live! All Undergraduate and Graduate candidates who have filed for degree must reserve a seat for Commencement. Students will receive an email confirmation denoting your commencement ceremony and time. If you do not receive an email confirmation, please contact the Registrar’s office at graduation@usm.edu. For additional information regarding the Commencement ceremony, contact the degree auditors in the Registrar’s Office in Kennard-Washington Hall, room 110, on the Hattiesburg campus at 601.266.5006.